some relief from the discomfort caused by a cold sore. For ten dollars, I thought I’d give this medication a try, but I unfortunately only found it to be a disappointment. I applied the medication to the cold sore as directed and the medication didn’t seem to do anything other than disappear. The discomfort caused by the cold sore still shot through me at times and the cold sore didn’t seem to heal any quicker with me putting this medication over it. It turned out to be a real letdown as it was like I wasn’t even doing anything to try and rid myself of the persistent cold sore. 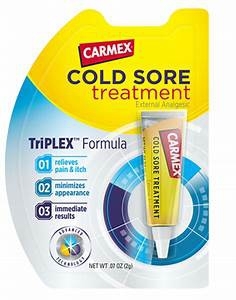 At least some of the other cold sore medications I had tried in the past, like the Nexcare Cold Sore Treatment medication, provided some relief even if the relief was minor. This medication though seemed to do nothing for me. and apparently underneath the sore, not a whole lot of healing was going on either because the cold sore ultimately stuck around for almost fourteen days before it really started to go away. Around ten to fourteen days seems to be how long a cold sore tends to last for me, so this medication obviously didn’t provide any significant healing help. The cold sore merely healed and went away on its own, and I didn’t need to spend ten dollars and take several minutes out of my day everyday to apply this medication for that to happen, so I basically just wasted money and time with this medication and ended up accomplishing nothing for my efforts. By the time the cold sore was gone, I wasn’t so much mad over the medication not working as I was relieved and happy that another cold sore was done and over with for now. medication simply didn’t work at all for me. Now perhaps, for other individuals out there, this cold sore medication may prove to be beneficial and worth every cent because different individuals react to different medications differently. I may have simply been one of the unfortunate it ones that tried the medication only to receive no positive results. I thus won’t be touching this medication ever again and wouldn’t enthusiastically recommend it to those that I know that suffer from cold sores as well because I wouldn’t know if the medication might react better for them or not. Medication can be funny like that. I though am rating this medication a “1″ because using it was like using nothing only with the added negative consequence of me being out ten dollars and me also being out those minutes I took every day to apply the medication in the hopes that it would work and ease my discomfort, which simply didn’t happen.